YOU have made a difference for Molly! Molly is grateful for you. You have saved her life. She says, "I have nothing I can offer to those sympathetic people for this great gift they've given to me but I’m praying for them." Before getting involved with her Granny Group, Molly's life was much like that of many other women in Uganda. She found herself at the age of 85 caring for two grandsons in a crumbling house. During the rainy season, the family could not sleep or cook because of the leaking roof. 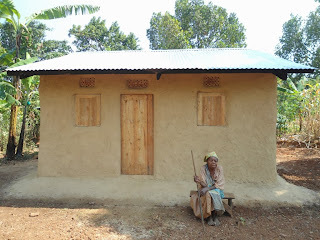 She had no money to build a new house and no hope. Still, Molly kept praying for a miracle. Because of you and donors like you, your grandmothers can help each other. The grannies in Molly's group voted to build Molly a new home, a pit latrine, and a kitchen. Their new home is big enough that she and her two grandsons can live comfortably. Molly says that even the granddaughter who has been staying at her relative's place will be coming back home very soon. Molly told us "Even if I die today, I will go to my grave a happy woman." Molly's family and many others are safe, intact, and happy because of you. To learn more about what the Grandmothers Project does and what your donations do for families in Uganda, click here!